The importance of Requirements Management cannot be understated. Enterprise Architects consider requirements to be the cornerstone of any architecture process as they are often the deciding factor between success and failure. Introducing the requirements capturing and management features within the Enterprise Architect platform. Maximize connectivity of the requirements model with processes and artifacts. Video demonstration of the powerful Specification Manager for requirements. the Unified Profile for DoDAF-MODAF (UPDM) and ArchiMate. The Zachman Framework is a widely used approach for engineering Enterprise Architecture. The Framework is a simple, logical structure that helps in organizing the information infrastructure of the Enterprise. The Open Group Architecture Framework (TOGAF) is one of the most widely accepted methods for developing Enterprise Architecture, providing a practical, definitive and proven step-by-step method for developing and maintaining Enterprise Architecture. The MDG Technology for UPDM tightly integrates with Sparx Systems Enterprise Architect and provides a model-based framework for planning, designing and implementing the Unified Profile for DoDAF and MODAF (UPDM) architectures. 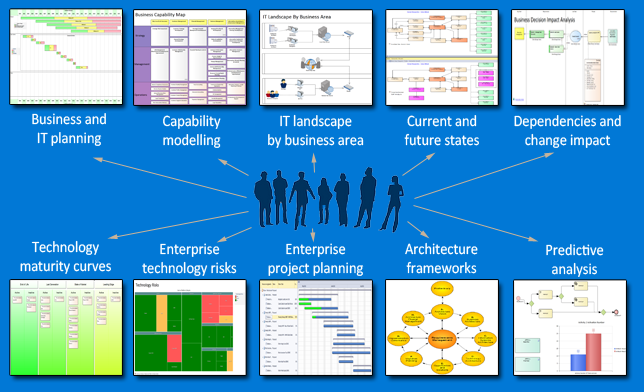 ArchiMate is a common language for describing the construction and operation of business processes, organizational structures, information flows, IT systems and technical infrastructure.